Our first night at dinner was decidedly delectable. Nana had arranged for all our meals to be a buffet with items of our choosing. I can’t remember what I ate, but it was good. Nana casually mentioned that Jonas had left careful instructions with the staff about our meals and our care, after she had laid out her expectations. I wondered about this mysterious Jonas, the owner of the resort. According to Nana, he is the only Ghanaian to have sole proprietorship of a beach front resort in the Western Region of Ghana. Most – if not all – of such ventures comprise of a husband and wife team, one of those generally being an expatriate who fronts all the capital, while the Ghanaian half of the entity is used to present just enough exoticism and feel good-ism to provide a heartwarming image for the guests and the national image. I despise that narrative. I decided that I liked Jonas immediately, without having had the benefit of meeting him. Portia had mentioned that he was extremely talkative, and not an endearing way. How was that even possible? Talkative people are delightful! Who wants to spend an evening with brick wall? After dinner I went to the reception area to get on the internet and hopefully do some people watching. Mariel was browsing through the artifacts that were for sale. She beamed when she saw me. It was as though she was waiting for someone to ask. Well how about that? I never knew we had colonial mansions in Ghana! It all sounded very romantic. I imagined that I might be a house girl running through the narrow corridors of one of those great estates. “I was thinking we could set off around 10:00 am?” she mused. We said good night a little afterward and went to bed. I drifted into a deep sleep, lulled by the sound of the crashing surf and then was jarred awake in the middle of the night by Nana’s dancehall/R&B/rap mix which she preferred to sleep with. The next morning Chanelle came pounding on our chalet door. “Wake up loves! It’s time for yoga and a run,” she roared. I discovered that she had lost almost 100 lbs in the last 2 years and had become an exercise nut. I applauded her for that, but I had lost all the determination to exercise at some point during the night. I buried my head into my pillow and listened to Nana give Chanelle her apologies. She said she would join her for yoga after she came back from her run. And just like that, she took off like a wily leprechaun. Nana had driven 6 straight hours the day before, and didn’t wake up when Chanelle returned. I however was dressed and ready to go for a walk. Chanelle corralled me and informed me that I’d be doing yoga instead. “Great! I’ve never done yoga before,” I admitted. “Whaaa…?!? You’re going to love it!” she shouted. Chanelle instructed me to grab a towel. She had arranged for the conference center to be used for our yoga sessions. It was hard for me to imagine Chanelle at peace, but I nodded as though I agreed with the idea all the same. Soon she took me through a few breathing and stretching exercises. It felt amazing. My mind was focused. 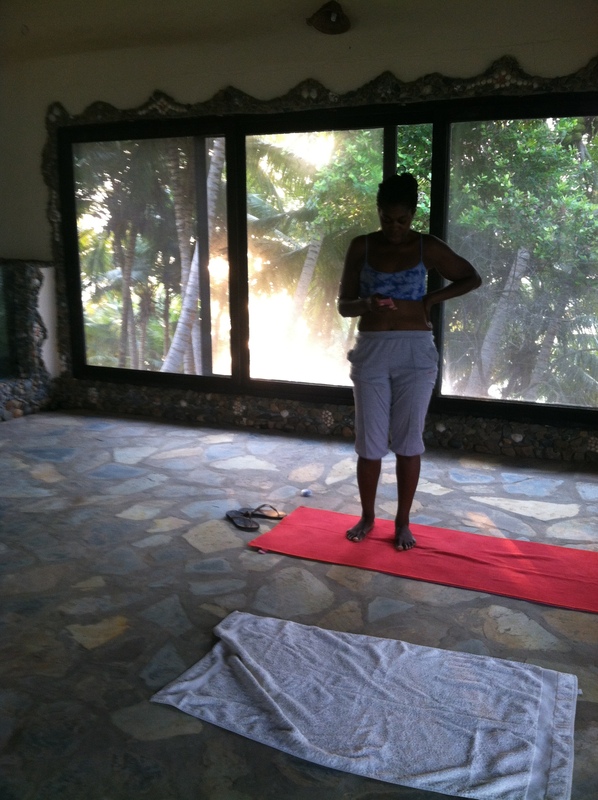 I felt centered…Basically all those fuzzy things they tell you yoga does for you. After breakfast, we set off for our adventure. The twins, Abena and Charlotte, rode in one car, and Emefa, Chanelle, Mariel and I rode in another. Nana and Portia elected to stay behind for a day on the beach. We had decided that we would try to hit three historical sites that day. Nzulazu, which is a village built on stilts in the middle of a lake, Fort St. Anthony and Prince’s Town. The fort was the quickest to get to. There was a funeral taking place just outside the walls of the fort, which was in the process of being painted. The entry on Wikipedia said it was a small fort that was built by the Portuguese in the 1500’s and later purchased by the Dutch. It made no mention of what the fort was used for, which soothed me into a false sense of tranquility. It talked about a lighthouse on an island and a picturesque view, and that’s what I set my expectations on. I was not disappointed. The view from the top of the fort is indeed beautiful. In the distance I could make out the roof of an old light house sitting on a deserted island. The water was azure blue and emerald green. The guide showed us where the European governor in charge of the fort was buried and then began to tell us about the commerce that he and the town’s people were involved in. Very soon, the full scale of the horror hit me like a herd of spooked horses. 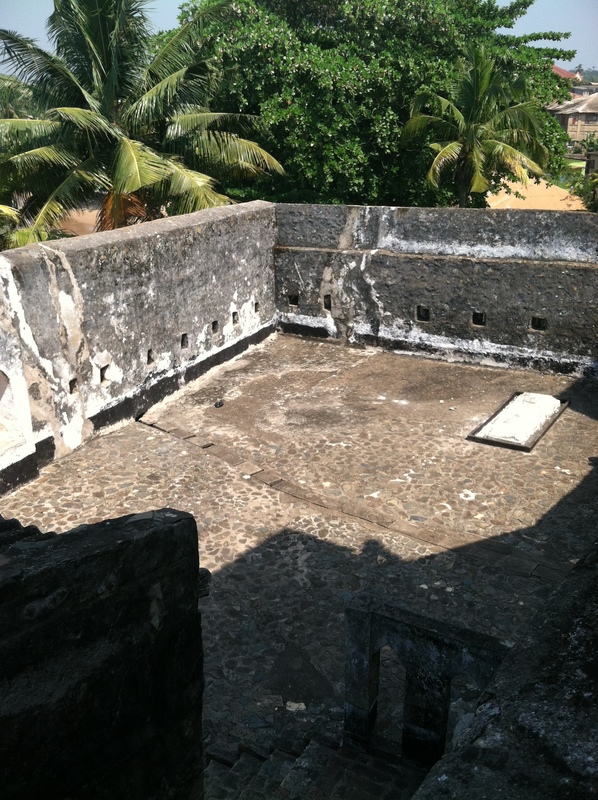 Courtyard where slaves cooked and exercised. “This is where they would keep the slaves – from six to six,” he said in very simple English. There was no chaser. He rattled off the facts without any emotion or any warning. I had come to see mansions! And here he was telling me this was a slave fort? Foolishly, I had assumed there were only two of such forts in Ghana: Elmina and Cape Coast. I soon found out that there were dozens of smaller forts dotted along the coast where slave raiders and traders would pack off their human cargo, parcel them off according to the mark that had been seared into their flesh with an iron brand and shipped to the Americas. “You see, because the rooms were too hot…that is…not enough ventilation…they keep them here in the yard and then send them back to the dungeon in the evening,” he said glibly. He has probably given this tour a hundred times, and most likely desensitized to the malevolence that this fort represents. I can’t say for sure. I never asked him. He showed us where the soldiers would have their meals and entertain guests. Then he showed us the galley and the room where the governor slept (which was locked, so we couldn’t enter). After he took us up a flight of stairs, he opened a small, short door and didn’t say a word. I had an instant panic attack. “What do you mean?” I said, my voice growing thinner and higher as my stress level increased. 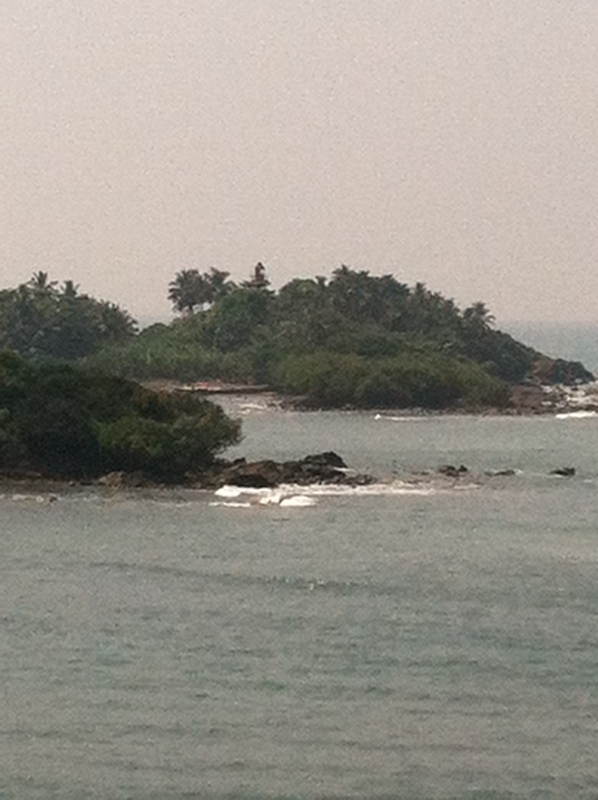 As it was explained, Fort St. Anthony was built on a very craggy patch of beach land. The large slave ships couldn’t dock close to the fort, so they would wait a few hundred yards out by the lighthouse in the middle of the ocean. The captives would be sent through this dark underground tunnel, chained one to another, loaded onto skiffs and then locked up on the large slaver. I felt sick. I felt an unexplainable sense of despair. I felt trapped. I felt something in the belly of my spirit die. I almost begged him to shut the door so we could move on, but I didn’t want to be overly dramatic. I decided to step back, but my feet felt planted on the concrete surface. Something about that door connected with me on a visceral level. Had someone from my African-American side of the family been through that door? Nana says we can’t ignore cryptic emotions of this sort. Who knows what history might reveal? Finally, he did close the door after a few of the other girls had gotten their pictures and I was released from the confinement I felt, though I was still completely shaken.